The more pertinent question to ask other than whether the chicken or the egg came first is how do you cook eggs without an egg cooker? Preparing the perfect egg dish, believe it or not, can take time and practice. In fact, it can take multiple cartons of eggs before you really nail it. However, what if there were an easier way to perfect what is really an art form? That’s where the egg cooker comes in. This easy-to-use device can take a standard egg to an entirely new level, and it takes minimal effort from you. Whether you want the perfect omelet, scrambled eggs, poached eggs, or even an egg boiled to a soft, medium or hard consistency, an egg cooking appliance can achieve it. No longer do you have to slave away over a pot or pan, guessing whether your egg is ready. You can just fill your egg cooker with eggs, adjust the settings to how you want your eggs to cook, and walk away. Then, you can come back, grab a plate, and enjoy what the cooker has produced. Eggs are a staple food in many households. They are the centerpiece of breakfast, and they make delicious side dishes for lunch and dinner as well. If you’re ready to revolutionize your egg cooking experience for the benefit of your palate, consider one of these nine egg cookers below. Many egg cookers are only designed to handle four eggs. However, if you have a growing family, four eggs are just not enough. 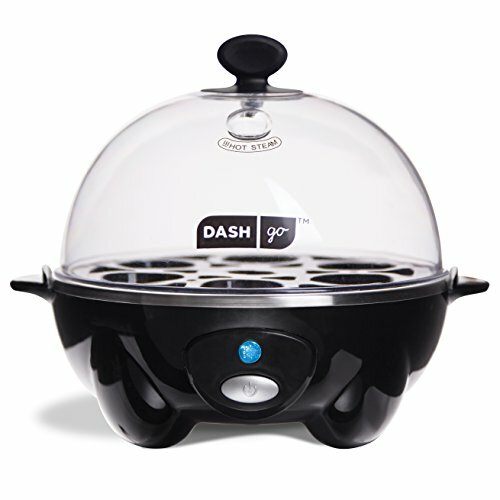 This Dash Rapid egg cooker delivers by providing space for six eggs – cutting down on meal preparation time. Well priced on the market, it’s an affordable and efficient kitchen appliance that will produce the perfect egg dish every time. Whether you want a soft, medium or hard-boiled egg, it will cook it to perfection. However, it does more than just boil eggs. This egg cooker can make a delicious and nutritious omelet, it can poach eggs, and it can even scramble them too. There is simply no egg dish it can’t handle with absolute ease. This cooker is also very easy to use and doesn’t require a lot of effort. You just fill the measuring line up to the consistency you want, push the ‘on’ button to get it started, and it will turn itself off when your eggs are finished cooking. Cleaning up is also a breeze, as every part aside from the electric components are safe to put in the dishwasher. This egg cooking appliance comes with a measuring cup, poaching and omelet trays, and a holding plate for six eggs. Start the day on the right foot and purchase an egg cooker for a delicious breakfast treat. Available in red and black, this Dash Deluxe egg cooker is taking breakfast time to an entirely new level. If you’re tired of having to rush around cooking breakfast, with never enough time to spare, this egg cooker can help. For the growing family, breakfast is a must. 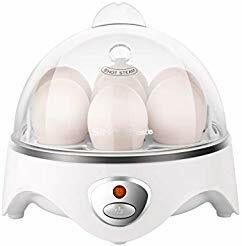 This egg cooker enables you to cook up to a dozen eggs at a time, meaning you just need to set the egg cooker and forget about it until the eggs are cooked. You don’t need to worry about pots and pans, timers or thermometers. Just put your eggs in, choose how you wish for them to be cooked, and get your plate ready. Not everyone wants a soft, medium, or hard-boiled egg for breakfast, and this egg cooker gives you the option to choose. Mix it up a little and opt for scrambled eggs, poached eggs, and even omelets. What this egg cooker can’t do is not worth doing. Once your eggs are cooked, it also turns itself off. Therefore, you can just sit down at the table, enjoy your eggs, and don’t worry about a thing. All parts, excluding electric parts, are safe to put in the dishwasher, and it even comes with a recipe book and a 1-year warranty. This cooker is a premium product that is well worth adding to your kitchen appliance collection. 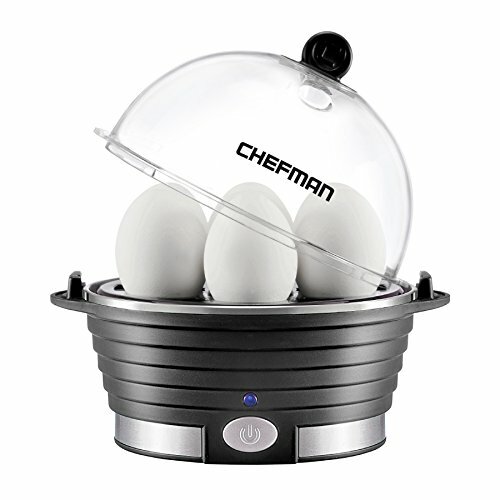 Affordable, stylish, and easy to use, this egg cooker from Chefman stands out in a league of its own. If time is of the essence and you need to feed everyone at once, this egg cooker can help. It’s faster than any stove method, takes up minimal bench space, and best of all, it’s affordable to purchase. This cooker can boil up to six eggs in just minutes and only requires you to add water and plug it in. Once your eggs are cooked, you can remove them, serve them, and put all non-electrical parts in the dishwasher. Breakfast meal preparation has never been easier! 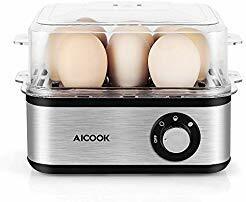 This egg cooking appliance is also very safe to use, giving you peace of mind that a minor lapse of memory won’t harm your appliance or your kitchen. As it’s cETL approved, it has advanced technology that enables it to turn off when it senses there is no longer any water left. This protects the motor from burning out or your meal from burning. Alongside the egg cooker, you also receive access to Club Chefman which provides you with videos, recipes, help, and cookbooks to put you on the road to becoming a culinary genius. What’s more, you also get a 1-year warranty. There’s every reason to consider purchasing this egg cooker. 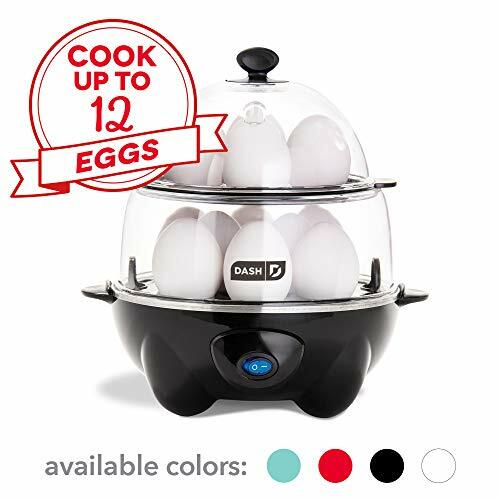 There are so many convenient kitchen appliances on the market, but no more convenient than this egg cooker from DBTech. Designed to take the hard work out of meal preparation, it’s affordable, easy to use, and looks stylish in any kitchen. Designed to tie in with the décor in most kitchens, it takes what can often be a stressful time of day – meal time – and turns it into a relaxed and calming experience. What’s more, if you’ve never had much luck with boiling eggs to perfection, this egg cooker enables you to do so. It’s capable of cooking between one and seven eggs at a time, only requires your eggs and water, and shuts off automatically when it’s finished. It heats up quickly, has your eggs ready in just minutes, and even alerts you with a bell when it’s time to dig in. As the top of the egg cooking appliance is clear, you can also watch their progress, all before you remove the egg tray and serve them on each family member’s plate. There is no mess or fuss associated with pots, pans, and slotted spoons, and cleaning up is also a breeze. Let this cooker slice minutes off your mealtime preparation. If you like all your kitchen appliances to look picture perfect, it’s time to invest in this egg cooker from Vobaga. Designed to look stunning in any kitchen environment, it’s a premium product that’s both effective and affordable. Whether you prefer eggs that are soft, medium or hard-boiled, this egg cooker can deliver. It can make seven hard boiled eggs, up to three poached eggs, and can even make an omelet or scrambled eggs, too. No matter what your egg preference is, you will find all the boxes are ticked with this Vobaga cooker. It’s also straightforward to use, only requiring you to put water in the base of the tray, add your eggs, choose the desired temperature and turn it on. Once the eggs are finished, just switch the dial off, unplug the appliance, and dig into a delicious plate of eggs. Made of high-quality stainless steel, this egg cooking appliance is built to last, and there’s no reason why you can’t enjoy eggs every day of the week for many years to come. What’s more, you even receive a free measuring cup to help you execute perfectly cooked eggs every time! This electric cooker is definitely one of the many premium options to consider. This quirky and fun egg cooker will put a smile on any homeowner’s face – all the while ensuring they get a delicious and well-cooked egg every time. Shaped like a hen with both feather shaping and a hen’s face, it’s a fun addition to any kitchen while being functional at the same time. 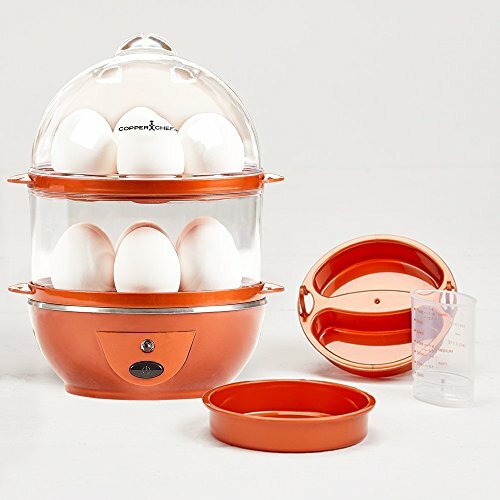 It can poach four eggs at a time or boil up to seven and offers instructions on how to perfect soft, medium, and hard-boiled eggs depending on the water level. Just add water to the desired level, add your eggs, and carry on with your day while it works its magic. This egg cooker also comes with a piercing pin which helps to stop the shells from cracking, as well as offering parts that are all dishwasher safe. Cooking breakfast, lunch, and dinner just got easier! When you’re tired of mealtime taking up more time than it should, invest in this Maverick egg cooking appliance. The kids can have fun watching it cook, and you can use your time on more important things. There’s no time like the present to streamline meal time. Mealtime can be tough, especially if you’ve got a lot of mouths to feed, but other chores to take care of too, and no convenient appliances such as egg cookers to help. By investing in an egg cooker from Hamilton Beach, you are investing in more time for other essential tasks. Eggs are a staple of many dishes, so why not use their low price tag and versatility to your advantage? This egg cooking appliance can prepare eggs in two different ways, giving your family the option to choose. It can cook up to seven eggs at a time, and can even cater to your preference of soft, medium, or hard-boiled. What’s more, if you prefer poaching instead, this egg cooker delivers. It comes with a non-stick poaching tray which is capable of poaching up to three eggs at a time. It doesn’t get much easier than that. When your eggs are finished cooking, a timer will go off, and you can plate up everyone’s meal with ease. The entire process takes just minutes, and you can then pop the non-electric parts in the dishwasher, ready for use next time. This egg cooker not only comes with the poaching tray, but it also has a water measuring cup and egg piercing tool to prevent the shells from cracking as well. 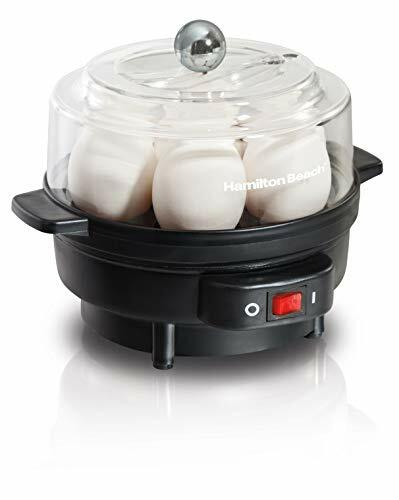 Save time and money with this egg cooker from Hamilton Beach. This egg cooker from HoLife is a premium kitchen appliance that enables you to spend less time in the kitchen and more time on more critical tasks. It’s affordable to buy, is durable with its stainless-steel shell, and provides an easier alternative to egg preparation. 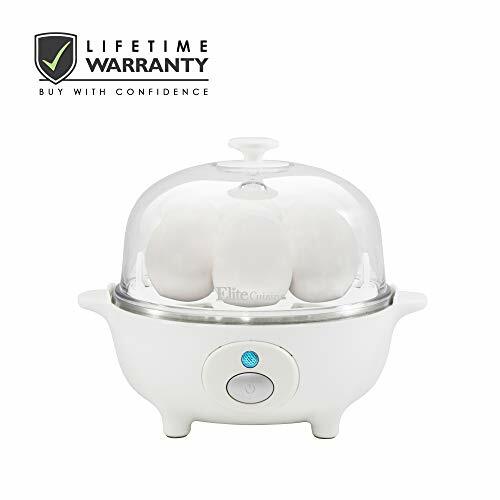 This cooker is capable of holding up to seven eggs and can cook them to a soft, medium, or hard-boiled style – depending on your preference. With just one button, you can have them cooked to perfection, without the need to clean pots, pans, or any utensils. Just add your eggs, add some water, and press the ‘on’ button. And, if you don’t want boiled eggs, you can also opt for scrambled, poached, or an omelet. You’ll be stocking up on cartons of eggs in no time. Once your eggs are cooked, or there is no water in the cooker, it will let you know. You can then eat the eggs and carry on with your day. It doesn’t get much simpler than that! Not all egg cookers for sale are of equal quality. Some are made of substandard materials, and some just don’t cook eggs as they are supposed to be cooked. 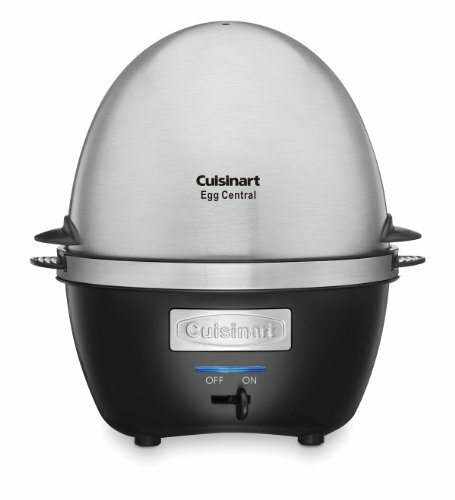 However, this premium Cuisinart egg cooker bucks the trend altogether. Not only is it styled beautifully to tie in with any kitchen décor, but it can cater to families both large and small with a range of egg dishes. You can soft, medium or hard-boil up to 10 eggs, and can even poach four eggs at a time, or make an omelet. When you’re feeling a bit peckish, this cooker can satisfy your hunger in just minutes. The consistency of your egg is determined by the amount of water you add, so ensure you check this before turning the egg cooking appliance on. However, the process is simple. Add your eggs, add your water, and leave it to cook. You will be amazed at the results.